The most common decision a player should take in the course of the game is whether to "hit" (draw another card to the hand), or "stand" (stop at the current total). This is a choice that each blackjack player must make for every dealt hand. The first option is to hit and it means that you want to draw another card for your blackjack hand. If you decide to hit, the dealer will deal another card to you face up. You should hit in blackjack if you think that taking another card will give you a greater chance of getting closer to 21 or equal to 21. The second option you have is to stand and it means that you stick to the current hand value of your cards. You should stand if you think that your current hand total is high enough and you can win against the dealer's hand. One more reason to stand is when you have a higher chance to bust if you draw another card. 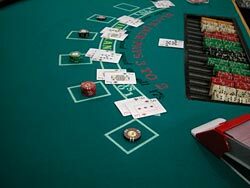 An experienced blackjack player will not take a decision to hit or to stand considering only two initial cards. There are other factors to consider like the up card of the dealer and the calculated winning probability. Player’s short hints: If the dealer has a 7 or higher showing, hit until you have at least 17, if the dealer's showing a 2, 3, 7 or higher, you should hit a hard 12. In case you have two cards of the same denomination, there will appear a Split button. You can split the cards into two hands and play each hand separately, meaning that you will take cards to your first hand until you stand or bust, and then go on with the next hand. Each hand will be played out as usual and your original bet will be duplicated for the new hand. Some casinos allow you to split the hand again after you have been dealt another pair, while others don't. Player’s short hints: Always split Aces and 8s, never split 10s, 5s or 4s. After you are dealt your first two cards (any value), the option to 'Double Down' will appear. If you're absolutely sure that your hand will beat the dealer's, you may double your original bet. Once this option is selected, the amount of your bet is automatically doubled and you will be dealt one more card. The hand will auto-stand after this card. 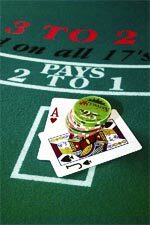 Player’s short hints: Always double on 11 unless the dealer has an 11 (Ace) up, always double on 10 unless the dealer has a 10, always double on 9 unless the dealer has a 7 or higher up. Insurance gives you a chance to protect yourself in case the dealer has a blackjack. When the dealer's face-up card is an ace, you can bet on whether the dealer has a blackjack or not. This is done before any other player actions. The insurance wager is equal to your original bet and is used to cancel out the likely loss of this bet. A winning insurance bet will be paid at odds of 2:1, and since you lose your original bet, you'll break even on the hand. Anyway strategy guides tend to advise against taking insurance. Player’s short hints: Unless you are counting cards, never take insurance. If you think that your hand is worth more than the dealer’s (judging from what you can see of it,) you can fold your hand and return half of your original bet and the casino keeps the other half. You need a really bad hand for a surrender to be profitable. Once you draw a third card, or double down, or split, surrender is no longer an option. Player’s short hints: The only hands you should ever surrender are hard 15 against a ten, or hard 16 against a ten or Ace.